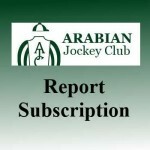 Here at ArabianRacing.org, the web site for the Arabian Jockey Club, your privacy is very important to us. We believe that your personal privacy is an important component to ensure continued long-term growth of the Internet as a communication and business environment. As a customer your privacy is an essential ingredient for us to conduct business on the Internet and we take this issue very seriously. At no time will we sell your information or release your personally identifiable data to a commercial enterprise other than our official sponsors and business partners. Our primary goal in gathering information from you is to either complete a transaction with you, enhance your experience on our site or for the purpose of serving you better as a customer. ArabianRacing.org has created this privacy statement in order to ensure your confidence in our organization and our commitment to your privacy. Participation in certain Registry programs requires the collection of personal information (for example, your name, address and e-mail address when joining as a member). We use this data to share new information with you about our company or services. Bulletin Boards and Forums are made available on our web site for use by the Arabian horse community. Although sign-up information for using our Community Forums is minimal and kept confidential, any information you provide in the forums or bulletin boards themselves is assumed to be in the public domain. Please exercise caution when communicating any personal information in any public forum.